A longer cruise at a relaxed pace with more time to get “off the beaten track” and discover the secrets of Halong Bay and Bai Tu Long Bay, visit fishing villages, explore by tender and experience unforgettable dining.This worthwhile three-day trip on Red Dragon cruise offers the highest quality luxury and comfort as you enjoy wonderful Halong Bay. Cruise with us and have a once in a lifetime experience. 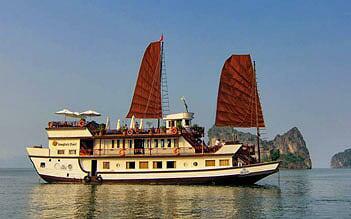 7.30 – 8.00: Optional pick up at your hotel in Hanoi’s Old Quarter area. My family spent Christmas on the Red Dragon this year, taking the two night/three day package and it was an amazing experience. The boat is the perfect size as it hosts 10 people so you can meet and mingle with new faces without having a big group around you. Our co-travellers were very nice and we all had meals together which felt very homely :)! 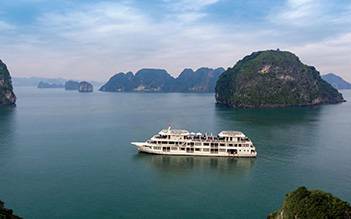 The boat also goes on a tour of Bai Tu Long Bay which is less visited and more preserved than Halong Bay and i definitely found the trip more peaceful. Finally the staff is so kind, Mr T told us tales about Vietnam, Cai and Hai were nice and entertaining, the chef cooks the most amazing food. A memorable experience! My wife and I have just been on the Red Dragon Junk and had the most wonderful trip.Mr "T" the guide is very good at his job and has great English language skills. The barman Mr "Cai" is also very friendly and runs a good bar. Quality and quantity of food excellent. The size of Red Dragon with five cabins makes it a lovely size for couples and those who are looking for a more personal experience. 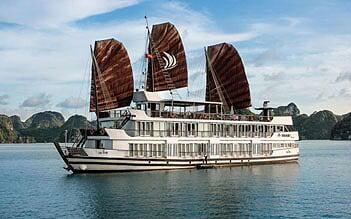 We booked the 3D2N cruise with our family (kids 14, 11 and 8) on the Red Dragon. From the moment we were collected in the luxury van we wanted for nothing. Bottled water was in the van, our host explained what we were doing and the check in at the port was easy while our bags were loaded for us. 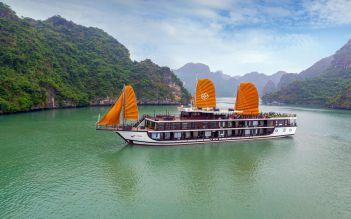 During the cruise the food was fantastic and plentiful, the staff couldn’t help enough (especially Mr T and Mr Cai) and we loved the kayaking and interacting with the other travellers. 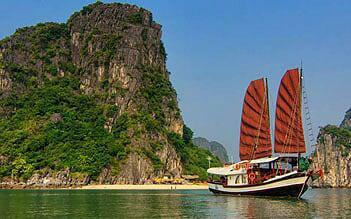 It sounds expensive, and it was the big splurge on our trip to Vietnam, but it was totally worth it! 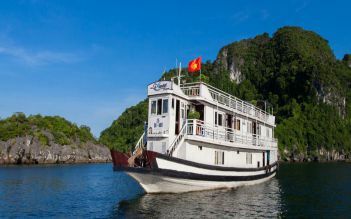 After researching a trip out of Ha Long we (two older adults and our 46-year-old daughter) chose to cruise two nights on Bai Tu Long Bay in the Red Dragon (an Indochina Junk with five cabins) to avoid crowds on board and at sea. 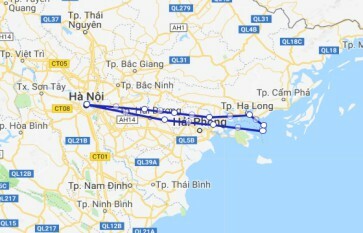 There were nine guests on this trip. My wife and I had the forward cabin with a queen and a single, windows on both sides, AC, glass walled shower, wood walls, ceiling, doors and floor. The ship, including its galley were attractive, clean and well maintained. 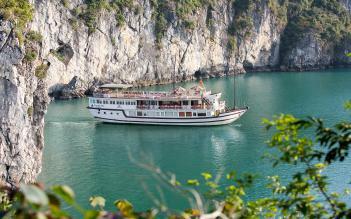 The scenery was jaw-droppingly beautiful and all the more enjoyable with fewer boats than Ha Long Bay. Sea was calm. Excellent multi-course meals were served al fresco on linen. Kayaking, swimming, shore lunch, cave visit and floating fishing villages were enjoyable. Seven crew. Each did his job well. Mr. T (“guide”) and Cai were the two who interacted with us. They were attentive, obviously eager to please and succeeded in making us comfortable. No complaints from any of us - only compliments. 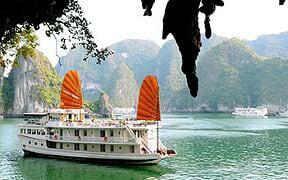 Red Dragon on Bai Tu Long Bay met or exceeded expectations.